It is with sadness that we announce that long-time team member James Bath will be bidding farewell to Woodlore later this year. Since joining the company in 2006, James has become a key member of the team, ultimately earning the role of Woodlore’s Head of Operations in 2010. In 2009, James became one of only two course leaders to reach the level of Fundamental Instructor, alongside fellow leader Dan Hume. James will be leaving his full-time position at Woodlore to explore a new career path nearer to his home county of Cumbria, and as such has now stepped down as our Head of Operations. James will however be staying on to finish the rest of our UK courses this year as both an Instructor and Quartermaster. On this note though, we are very excited to announce that Dan Hume will be stepping up to the role of Woodlore’s new Head of Operations this month. Dan joined the team in 2007, where his motivation and dedication shone through. Since then, Dan has led a number of our UK courses, including the Fundamental and Traditional Living Skills, as well as assisting on our Arctic Expeditions. As Woodlore’s newly-appointed Head of Operations, Dan will be in charge of leading our outdoor team, overseeing all of our existing courses, as well as developing new courses for Woodlore in the UK and overseas. On another positive note, this October will also see the arrival of Keith Whitehead as a full-time member of staff here at Woodlore, as both our new Quartermaster and Aspirant Instructor. We are very happy to be welcoming Keith to Woodlore full-time, where we are certain he will prove to be a vital part of the team. Keith will continue to lead and assist on our courses here during the UK season, and will then be in charge of maintaining all the kit and equipment used for our courses during the winter. 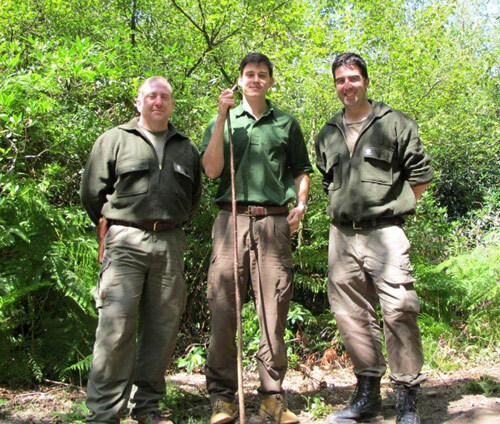 Everybody here at Woodlore wishes all three of them the very best with their new roles for the future. This entry was posted in Site Announcements, The Woodlore Team on August 18, 2011 by Woodlore Team. Sorry to see you go James. Best of luck in the future, Wulamallesin. Congratulations Dan & Keith!